After a small hiatus, the Monday Freeview is back bringing you the best and worst of free entertainment in all shapes, forms and sizes. 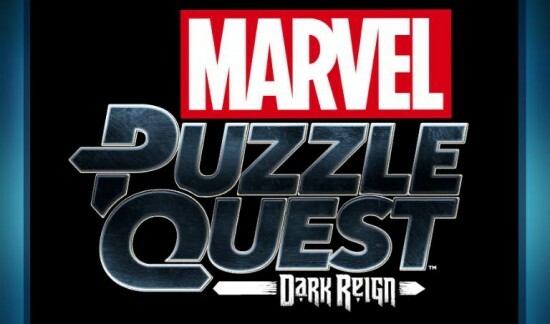 Today we look at the mobile app, Marvel Puzzle Quest: Dark Reign. First off, thanks for staying timely Marvel. Dark Reign as a status quo happened between 2008 to 2009. But since it has been plastered in every Marvel book over the past month, I figured it was worth a shot and gave it a download. As you might have guessed from the name, the Marvel universe is put into the gem matching world of Puzzle Quest though there are some dramatic differences due to the game’s free to play nature. Puzzle Quest focuses on playing out combat scenarios using the Bejeweled method of lining up three, four or five gems of the same color in a row. In Puzzle Quest, these combinations deal damage according to the player’s choice in character. The gems also tally up and can be cashed in by the player for various attacks, again determined by who the characters on the board are. Each side can have up to three characters and wins when the other side is knocked out. After a match, experience in the form of ISO’s is distributed and various unlockables can be won as well, encouraging a player to repeat the same battle multiple times. So on the Monday Freeview, we have brought you some examples of free shows or games you’ve been able to get a hold of. Up until this point though we have ignored two very important “free” options in the gaming world. These are the downloadable gaming libraries available to those subscribed to the XBox Live Gold and PlayStation Plus services. While these services are technically not free, the inclusion of downloadable titles has been added to them as an added value while both primarily serve as a way for gamers to play online for the XBox 360, XBox One and PlayStation 4. First, let’s take a look at the PlayStation Plus service. Originally a waning service as it wasn’t required for online play, the Instant Game Collection was one of the features that had not been fully exploited. 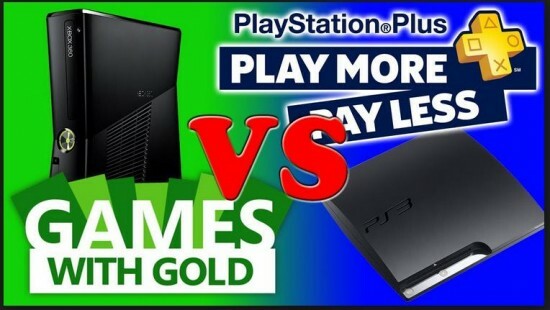 It wasn’t until about two years after the service launched in June of 2010 that they began offering full PlayStation 3 titles to the roster as opposed to mainly retro games or PSN titles. Normally, the Monday Freeview gives you a heads up on freebies that you will probably want to download. In this case though with iFruit, it is more likely an app you have the urge to download but probably shouldn’t waste a half gig of space on your iOS device for. 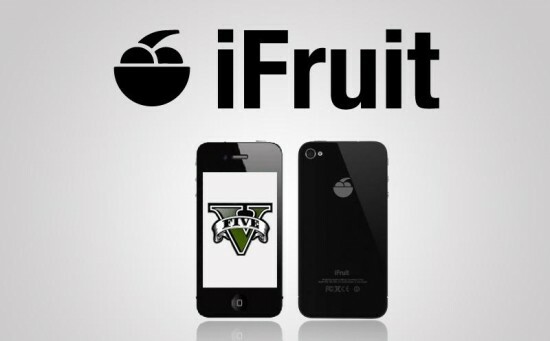 As some of you may have already experienced only to give up, there were some pretty large problems with the transmedia experience tied from mobile devices to a person’s Rockstar Social Club account which of course ties together with their in game Grand Theft Auto V experience. Without even getting into the app itself, there were days where players couldn’t even download the app and then others where logging in was near impossible too. Finally, when you do get in what you’ll find seems like a cool concept. Go in and customize the three vehicles owned by your three main characters. Play with chop, Franklin’s dog, and teach him tricks he can use in game. Browse LifeInvader, the in-game parody of Facebook. All interesting concepts that all ultimately end up falling flat of their potential. After an epic launch party at the YouTube Space LA on Wednesday night featuring cast, crew and fans, the second season of Video Game High School launched on YouTube and FreddieW’s Rocketjump.com. After over $800,000 in Kickstarter backing from his loyal fanbase, Freddie Wong and his team put together the second season of his digitally distributed show about a world where gamers are the star athletes and the most prestigious school to attend before going pro is known simply as Video Game High School. Season 2 of VHGS follows Brian D, Jenny Matrix, Ted Wong and Ki as they continue their path toward being pro gamers while deal with all the trials and tribulations of high school like making it to class on time, their spot on the team and of course, first love. The series also features cameos from various YouTube and non-YouTube celebrities like Epic Meal Time’s Harley Morenstein as the school’s dean, Zachary Levi as the FPS 101 teacher and even Stan Lee in the first episode of the second season. Some games are challenging by design like the Mega Man series. Some games are challenging because of poor control or camera like Superman for the N64. And then there are games that are challenging for another reason, because their creators are pure evil. 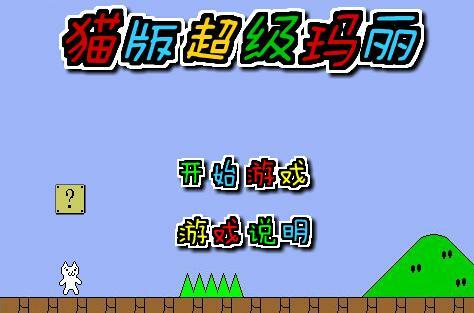 Cat Mario is one such example of a game designed to induce rage quits. Why put yourself through a game like Cat Mario? Well first off, it is free and we all know how gamers can’t back away from freebies. But it is the nagging challenge dangled in front of the player’s face. The carrot of beating a game harder than Super Mario Bros. which they’ve all beaten before and doing so in a manner most of our friends couldn’t is a premise too hard to skip over, at least on the surface. And then the game actually starts. When I went to the Apple App Store last night looking for something for the Mondayy Freeview, I figured I would help put everyone in the Memorial Day spirit and looked for the first App to pop up to pop up with Memorial Day in the title that was free. The one I came across was Memorial Day Barbeque Mayhem and had a four star rating with fifteen reviews. I figured even at only fifteen ratings, it couldn’t be that bad if it still had four stars, right? Plus, who doesn’t love a Memorial Day BBQ? Oh, how wrong I was. 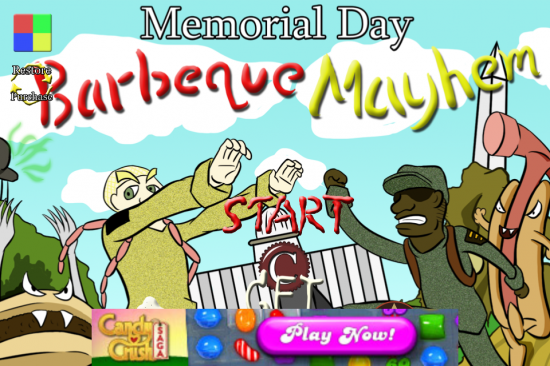 Memorial Day Barbeque Mayhem is what I like to refer to as a “jumper” where a player has the screen moving for them as their character travels left to right at whatever pace the game wants. It isn’t a full platformer because the X axis motion is completely out of the player’s control. Instead, they just control when and how high they jump. Unlike games like Robot Unicorn Attack 2 which features additional actions like charging, Memorial Day Barbeque Mayhem keeps itself limited to just jumping. Now as a mechanic, this can work except for the hordes of issues that plague the game. Way back in late 2010, Doritos brought out their second free game Doritos Crash Course to the XBLA. 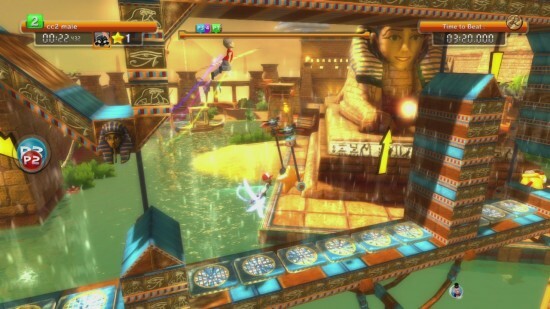 The title used XBox avatars as characters in a Wipe-Out / MXC style obstacle course. Luckily, the Doritos name was only present in the title and it never became a hit you over the head advertising ploy. There weren’t any Doritos speed boosts or Cool Ranch extra lives. And it ended up being pretty fun, despite only having three sets of courses that all looked pretty similar. Doritos Crash Course 2 brings back the fun gameplay of the original with four distinctly different environments, a new unlockable progress system and support for Avatar FameStar. While the environments do a great job of adding visual variety, it’s the system of unlocking new content that gives Doritos Crash Course 2 an original feel. Instead of just progressing in order through levels, players unlock medals and stars that they use to purchase new levels. Getting certain placement against AI opponents earns a player more medals while taking various paths through a level allows access to different stars. Sometimes we find some real hidden gems that have lots of thought and effort behind them for the Monday Freeview. 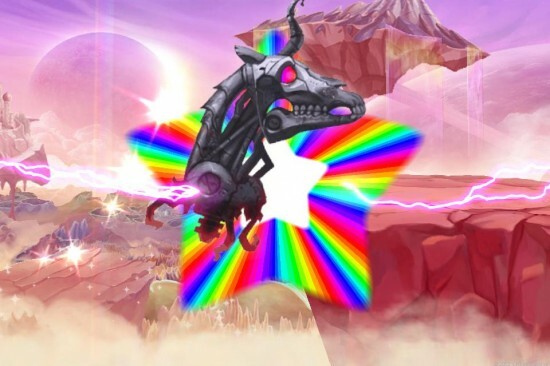 These games have teams of hundreds working on them to create persistent MMO worlds or an ever expanding cast of unique characters… and sometimes we find Robot Unicorn Attack 2. A sequel to one of the most popular Adult Swim games to make it to iOS, Robot Unicorn Attack 2 is an incredibly simple game. Players hit one side of the screen to jump (and double jump) and the other to dash. That’s all you get for controls. While the game has special boosts that can be purchased with in game currency, the basic nature of this runner style game is an addicting premise. By giving players attainable goals, the game keeps leaving the bread crumbs to keep going “just one more time”. Additionally, a single game is divided up into three runs called “wishes” (keeping with the unicorn theme) so that a player gets in the routine of going just a little bit further and having to continue to the next run. By the time the third wish is complete and awards are given out, it doesn’t take much for a player to commit to three more. One thing we’ve seen with freebie titles on XBLA is that things can go either way. Sometimes you get Yaris (and the less said about that title the better). But sometimes, you get something that is worth spending even more time with than some of your full retail games. Happy Wars is one such game that follows the free to play model and something I’ve put in a fair share of time with since its release without ever needing to spend money in its Free-To-Play model. Happy Wars is a MOBA title featuring two teams of up to 15 players each. Players start off at opposing castles and taking the role of either a knight, mage or cleric, work their way across the battle field, taking control points until they reach their opponent’s castle. Unlike most MOBAs, there are no NPC characters chugging alongside the battle. All combat is player to player with a variety of skills that unlock as the battle progresses. Players are also able to switch between their knight, mage and cleric build mid-battle in between respawns to allow changes in strategy, something not seen in most MOBA cases.